Colorfully pattern your own bookmark. Metallic Cord Bargello Bookmarks, the first bookmark row must be prepared by the therapist or a volunteer. Two patterns and 2 sets of directions provide a range of assessment. Portable. 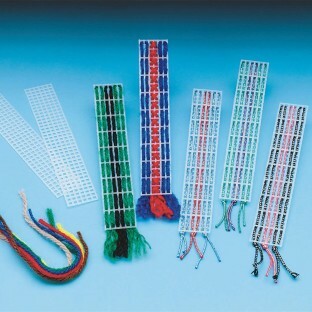 Kits contain precut plastic canvas (5 holes per inch) and metallic cord. Order plastic needle separately. 6 holes x 36 holes. Pack of 6. Level 3.0-4.8.